The first three items on this CD were issued together as CDGIM005, which has been unavailable for some time, and for this reissue the Great Canon of St Andrew of Crete has been added. I believe the recording of that piece was first issued in the early 1980s as part of a collection of Orthodox church music, which I’ve never succeeded in tracking down (CDGIM002). This present reissue was to have appeared a few months ago to mark Tavener’s 70th birthday in January 2014 but it was held back in deference to his death in November 2013. I was very glad to receive this disc for review as CDGIM005 was the first disc by The Tallis Scholars that I ever bought. That must have been about 25 years ago, which was some time before I developed an interest in Renaissance polyphony and started collecting discs devoted to that style of music; at that time I was lapping up as much as I could of Tavener’s vocal music. Though The Tallis Scholars are renowned primarily as exponents of the sacred music of the Renaissance their espousal of contemporary music, though very selective, is too easily overlooked. During their fortieth anniversary year in 2013 they frequently included music by several modern composers in their programmes and there were new pieces, written to celebrate their 40th anniversary by Gabriel Jackson and Eric Whitacre (review). The lengthy obituary of Tavener in International Record Review (January 2014) included a reference to a new work, Requiem Fragments, dedicated to The Tallis Scholars, which is as yet unperformed. By the time of his death last year Tavener had been established for many years as a leading British composer: but it wasn’t always so. By chance, I came across a review from the June 1991 issue of Gramophone, appraising together both of the original CDs mentioned above. The opening of that review by M.S. - in those days Gramophone reviews were not signed – began thus: ‘Perhaps the time is right for the musical establishment (and the record industry) to begin to recognise Tavener as one of our most gifted and important composers of choral music. I hope so, for a talent so prodigious and special as his appears all too infrequently in today’s climate of intellectually orientated creativity.’ I have quoted these comments for two reasons: it’s only fair to acknowledge the perceptive nature of that review (by Malcolm Stewart?) but it’s even more relevant to draw attention to the enterprise of The Tallis Scholars – and Gimell – in recording this music back in the early 1980s and then making it the basis of some of their very earliest CD issues. These were pioneering recordings. 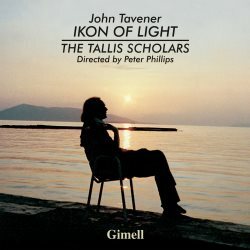 This was the first recording of Ikon of Light, a piece written for The Tallis Scholars and first performed in public, by them, at the 1984 Cheltenham Festival – which would have been after the recording had been made. Since then there has been one other recording of the piece. I’m not aware of any other recordings of Great Canon of St Andrew of Crete besides this one and I wonder if The Tallis Scholars were also the first to record Funeral Ikos. The recording of The Lamb probably wasn’t the first but this CD is very valuable in offering us a rare, perhaps the only, example of Tavener himself conducting on disc. It’s marvellous that this souvenir of him as a conductor exists. Incidentally, one of several things that I learned from Ivan Moody’s very interesting notes concerns the first performance of The Lamb. It was written for the 1982 Festival of Nine Lessons and Carols at King’s College Cambridge and I’d always assumed that was its first performance but Moody relates that the premiere was in fact given a couple of days earlier by Martin Neary, a long time Tavener champion, and the choir of Winchester Cathedral. Welcome though the composer’s own account of The Lamb is, that piece is almost ubiquitous on disc so the main interest lies in the more substantial works offered here. Funeral Ikos sets words from the Orthodox service for the burial of priests. The words are sung in an English translation. Moody says that the melody for the verses – there are six of them – ‘has its origins in Russian chant’, a comment which doesn’t make entirely clear to what extent, if at all, Tavener has modified the original. The very beautiful refrain of ‘Alleluia’ at the end of each strophe is Tavener’s own. The words, hauntingly set, convey the mystery – in the sense of unknowing – the majesty and the spirituality of death and Tavener’s music imparts a timeless feel. This is a very beautiful piece and though not all the words are consoling the music certainly is. Great Canon of St Andrew of Crete is a work which I’ve not heard before. Tavener sets only the first section of a much larger Canon. The text, translated into English, is penitential – indeed, it’s very penitential in tone. At the start the men’s voices are heard singing the first verse, the Irmos, which is then repeated; the music for this repetition consists of spare, open harmonies which apparently reflect medieval Russian polyphony. There then follow no less than 23 strophes chanted by a cantor and after each one the choir sings a refrain, which is sung either in Slavonic, Greek or English. If that sounds very tedious, rest assured that it’s not. The bass cantor, the excellent Jeremy White, while staying very faithful to the style of chant intelligently varies his delivery, often very subtly, and brings the words to life. Tavener’s refrain is hauntingly beautiful. Over the course of the piece the music very gradually descends in pitch; ‘a musical prostration’ as Ivan Moody describes it. Ikon of Light, which is sung in Greek, is a remarkable piece. It’s scored for double SATB choir and string trio, heard from a distance. The work is cast in seven sections, the central one of which, lasting some 20 minutes, accounts for nearly half the length of the piece. By the way, when you start to play the disc you won’t hear anything for some 23 seconds, which is quite deliberate, I’m certain. Then the string trio begins to play at the limits of audibility. In this first section the singers have only one word to sing, ‘Phos’, which means ‘light’, and the single chords to which Tavener sets this word and the way he uses these chords to punctuate the quiet, long string lines quite remarkably suggests bursts of light. A similar effect is achieved in movement VI. Movement II only has one word of text also. This time it’s ‘Dhoxa’, which means ‘glory’. Here, however, the choral writing is much more elaborate and the strings are silent. The heart of the work is the fourth movement, ‘Mystic Prayer to the Holy Spirit’. This sets words by St. Simeon the New Theologian (949-1022). The choral writing in this extended movement is quite remarkable. I can best describe it by saying that in the first section the music descends through the choir from highest voices to deepest in the sense that each section of the choir (SATB) in turn leads the declamation of the text. The music is unhurried and spacious and the recording itself brilliantly but very naturally distinguishes between the various sections of the choir. After a brief, meditative interlude for the string trio (7:28-9:45) the choir resumes the singing of St Simeon’s text but this time the music effectively ascends through the choir and the intensity of the music, which had built up towards the end of the first choral section, becomes significantly greater. After another short string interlude all the forces unite for the last four lines of text. Here the music becomes positively ecstatic in tone and one has the impression of the aural equivalent of blazing light. The seventh and last movement is related to the second and here, after ‘Phos’ (‘light’) has been sung in Movement VI, the one-word text for Movement VII, very logically, is ‘Epiphania’ (‘shining forth’). Here Tavener’s music is blazingly affirmative and, interestingly, the level of overt dissonance seems to me to be higher than at any point in the work. The piece ends rather abruptly. This is a challenging and fascinating works and it’s superbly performed here. The music on this disc is repertoire with which many people will not instinctively associate The Tallis Scholars. However, the same ultra-high standards of performance that characterise their recordings of Renaissance polyphony are just as apparent here. In passing, it’s interesting to note that several of the singers who took part in these recordings over thirty years ago - artists such as Michael Chance, Charles Daniels, Peter Harvey and Mark Padmore - went on to become distinguished soloists in their own right. So this is a disc that all admirers of Sir John Tavener should seek out. His music is exceptionally well served here and the pieces in question are all important ones. Though the recordings themselves are at least thirty years old they still sound extremely good; perhaps we shouldn’t be surprised at that since they were engineered by either Mike Clements or, in the case of the Great Canon, by Bob Auger. Originally planned as a seventieth birthday tribute, this disc is a now a most eloquent memorial to Sir John Tavener.